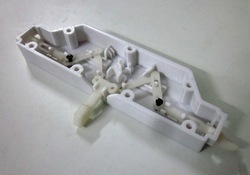 Pioneers in the industry, we offer sla prototyping services from India. SLA Prototyping Services or Stereolithography (SLA) is the oldest rapid prototyping method, and it is a mature, highly-precise and economical technology for creating design and function models. Stereolithography is the best method especially for small to medium-size prototypes requiring a high degree of precision and detail. Excellent surface finish and paintability is possible in this process. The models produced can also be used as a master for the silicon molds used in vacuum casting. Looking for SLA Prototype Services ?